A Thought: Storm’s a comin’! Better do your outdoor ‘stuff’ today, because storms are invading our weather the next few days through the weekend. But that’s ok. It’s Spring—storms clear the air of pollen, etc. The same is true in life: Storms brew when emotions make assumptions and then, BOOM! There’s an outburst. The pressure point bursts wide open and clears the air. So, as much as we dread allkinds of storms, they are really healthy, when unavoidable. 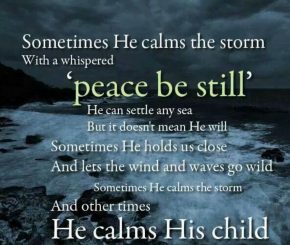 Today what can you do to bring the calm of Christ through the storm? Will you seek the Lord in prayer and listen to His counsel when you encounter a storm? Only Christ can bring you the Peace you seek. Have a Wonderful Wednesday!